Recent analyses of CD8 T cell responses to Listeria monocytogenes infection demonstrate that the duration of in vivo T cell proliferation is not determined by the amount or duration of Ag presentation. However, the extent to which T lymphocytes are capable of proliferating in the absence of Ag is unknown. Herein we demonstrate that CD8 T lymphocytes undergo up to eight rounds of proliferation in the absence of Ag following transient, 2.5-h in vitro antigenic stimulation. Ag-independent expansion of CD8 T cells is driven by IL-2 and is further augmented by IL-7 or IL-15. These experiments clearly demonstrate that CD8 T cells undergo prolonged proliferation following transient Ag exposure and support the notion that in vivo CD8 T cell expansion following infection can be uncoupled from Ag presentation. In vivo priming of Ag-specific CD8 T cells results in their proliferation, differentiation into effector T cells, and contraction into stable memory populations (1, 2, 3). The duration of in vivo T cell expansion is predictable following infection with the intracellular bacterium Listeria monocytogenes, lasting ∼8 days (4, 5). A remarkable feature of this expansion is that CD8 T cells with different peptide specificities undergo synchronous in vivo expansion, even though the peptides they respond to are present in different amounts and form complexes with MHC class I molecules that differ in stability (6, 7). Synchronous T cell expansion and contraction in the face of disparate Ag quantity and stability suggests that the duration of T cell expansion is not governed by the presence or absence of Ag. More recent studies have also supported the notion that the extent of in vivo Ag presentation does not determine the duration of T cell expansion. Administration of bacteriocidal antibiotics that limit in vivo L. monocytogenes growth to 24 h following infection did not shorten the duration of in vivo T cell proliferation (8). Remarkably, the kinetics of CD8 T cell proliferation were unaltered whether in vivo infection with live bacteria progressed for only 1 or 7 days. Because the amount of Ag and the severity of inflammation are vastly different in these two circumstances, this study further supports the hypothesis that cell proliferation does not cease because Ag is depleted. To explain T cell expansion during L. monocytogenes infection, we have proposed that T lymphocytes are programmed to undergo multiple rounds of division in an Ag-independent fashion following in vivo priming. To test this hypothesis, in the current report we stimulated Ag-specific T lymphocytes in vitro for short periods of time, removed them from Ag, and then characterized their proliferation. We find that transient in vitro stimulation for periods as short as 2.5 h is sufficient to program CD8 T lymphocytes to undergo up to eight cycles of division. These experiments unequivocally demonstrate that Ag is not required for T lymphocyte populations to expand and that generation of Ag-specific T cell populations can occur even when Ag presentation is transient. These findings have important implications for the development of protective immunity following infection and vaccination. BALB/cJ mice were obtained from The Jackson Laboratory (Bar Harbor, ME). WP11.12-transgenic mice expressing the p60449–457/Kd-specific TCR were generated as previously described (8). RAW264.7 macrophage-like cells and P815 mastocytoma cells were obtained from American Type Culture Collection (Manassas, VA). All cell cultures were grown at 37°C, 5% CO2, in RPMI 1640 medium (Life Technologies, Grand Island, NY) supplemented with l-glutamine, HEPES, 2-ME, antibiotics (penicillin/streptomycin), and 10% FCS. L. monocytogenes strain 10403S was provided by Daniel Portnoy (University of California, Berkeley, CA). CD8 T cells were enriched to ∼90% purity from the spleen by MACS (Miltenyi-Biotec, Auburn, CA) using anti-CD8a-conjugated microbeads. Whole splenocytes or purified CD8 T cells were washed with PBS and resuspended at 5 × 107/ml in PBS containing 1 μM CFSE (Molecular Probes, Eugene, OR). The cell suspension was incubated at 37°C for 10 min and immediately washed with cold RPMI 1640/10% FCS before plating. In peptide stimulation experiments, purified, CFSE-labeled WP11.12 CD8 T cells were plated at 2 × 106/well in 24-well plates containing 1 × 106 RAW264.7 cells previously pulsed or nonpulsed for 1 h with 10−6 M p60449–457 peptide. After 24 h, CD8 T cells were recovered by MACS sorting and transferred to 96-well plates at 2 × 105/well along with 2 × 105 RAW cells pulsed or nonpulsed with peptide. In Ab stimulation experiments, purified, CFSE-labeled CD8 T cells were plated at 1–5 × 105/well on 96-well plates containing various concentrations of immobilized anti-CD3 and anti-CD28 mAbs. At the times indicated in the figure legends, T cells were transferred into new wells with or without Abs. In splenocyte culture experiments, spleens were taken from BALB/c mice infected 3 days previously with 2000 L. monocytogenes. Dissociated spleen cells were enriched for CD8 T cells in some experiments, labeled with CFSE, and plated at 106/well in 24-well plates in RPMI 1640 medium with antibiotics. Proliferation was assessed daily by analysis of CFSE dilution by CD8 T cells over the course of a week. Recombinant murine IL-7 and human IL-15 were obtained from R&D Systems (Minneapolis, MN) and were used at a final concentration of 12 ng/ml. Murine IL-2 was used at a concentration of 5 U/ml. The following mAbs directed to mouse cell surface Ags were purchased from BD PharMingen (San Diego, CA): anti-CD8a-PerCP (53-6.7), anti-CD69-PE (H1.2F3), anti-TCRβ-APC (H57-597), anti-CD3ε (145-2C11), and anti-CD28 (37.51). PE-conjugated streptavidin tetramers of H-2Kd class I MHC complexed with listeriolysin O (LLO)91–993 peptide for detecting epitope-specific T cell populations were generated as previously described (6). For four-color analyses, ∼5 × 105 cells were incubated on ice for 1 h with saturating concentrations of tetramers and the various mAbs. Labeled cells were washed with PBS containing 1% FCS and 0.05% sodium azide and analyzed on a FACSCalibur flow cytometer (Becton Dickinson, Mountain View, CA) using CellQuest software. Our previous studies demonstrated that Ag-specific T lymphocytes expand in vivo for many days following antibiotic-mediated termination of active bacterial infection (8). To determine whether the expansion of CD8 T cells as occurs in vivo following bacterial infection requires intact splenic architecture, we characterized the expansion of LLO91–99-specific T lymphocytes among splenocytes that were dissociated 3 days following infection of BALB/c mice with an immunizing dose of L. monocytogenes. 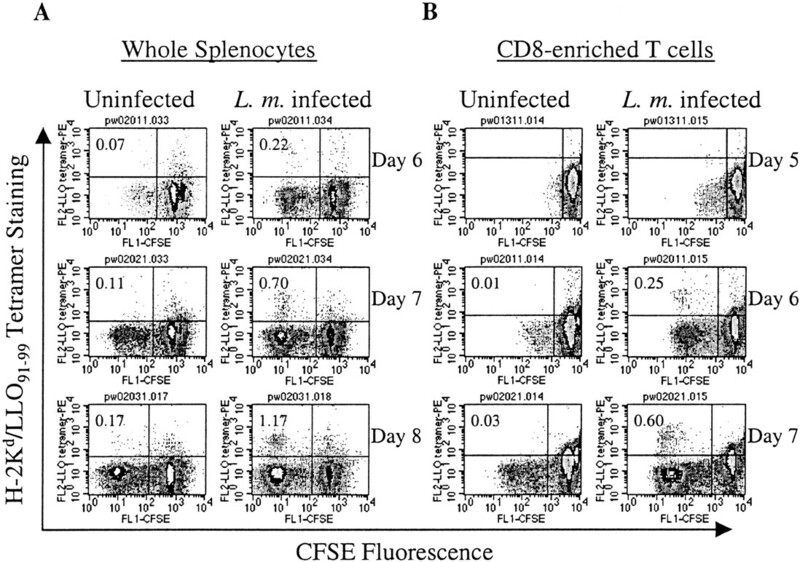 In vitro incubation of CFSE-labeled, dissociated splenocytes for various periods of time followed by staining with H-2Kd/LLO91–99 tetramers demonstrates that LLO91–99-specific CD8 T cells become readily apparent at the predicted 7–8 days following L. monocytogenes infection (Fig. 1⇓A). It is evident Ag-specific T cells have proliferated in vitro because their level of the CFSE dye, which is divided equally among daughter cells upon cell division, has decreased. To determine whether splenocytes other than CD8 T cells are necessary for proliferation of LLO91–99-specific T cells, we purified CD8 T cells from spleens of BALB/c mice infected 3 days earlier with L. monocytogenes and incubated them in vitro. Fig. 1⇓B shows that expansion of LLO91–99-specific T cells occurs in vitro for 7 days following infection, demonstrating that even isolated CD8 T cells are capable of prolonged proliferation when removed from the normal splenic architecture. Because these in vitro incubations were conducted in the presence of penicillin, streptomycin, and gentamicin, an antibiotic combination that kills intra- and extracellular L. monocytogenes, it is unlikely that LLO91–99 was being presented in vitro to the expanding CD8 T cell populations. We note that there is a smaller but significant accumulation of divided CD8 T cells in our uninfected control splenocyte cultures, which may be specific for environmental Ags the mice may be exposed to before analysis. LLO91–99-specific CD8 T cells expand in vitro after isolation from L. monocytogenes-infected mice. Splenocytes harvested from noninfected BALB/c mice or BALB/c mice infected 3 days previously with 2000 L. monocytogenes were used directly (A) or enriched for CD8 T cells by MACS purification (B). 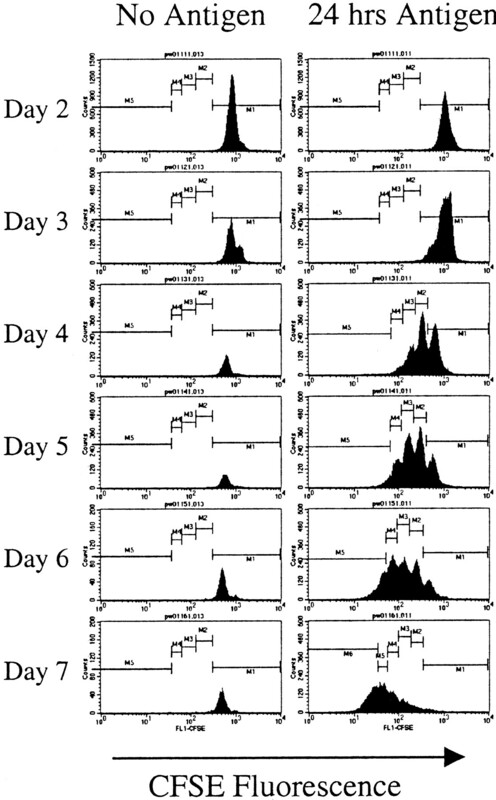 Whole splenocytes or enriched CD8 T cells were CFSE-labeled and cultured in antibiotic-containing medium in the presence of exogenous IL-2 and IL-7 for 3–5 days (A) or 2–4 days (B) following harvest. The dot plots show LLO91–99/Kd tetramer staining on the vertical axis and CFSE fluorescence on the horizontal axis. The day after infection is indicated to the right of each panel. These results are representative of three similarly infected mice. Because it could be argued that proliferation may be driven by small numbers of APCs still present among the CD8-enriched T cells isolated from infected spleens, we conducted experiments in which we stimulated naive L. monocytogenes-specific T cells for a brief duration in vitro and followed their proliferation following removal from Ag. Our first approach was to activate naive, CFSE-labeled CD8 T cells derived from WP11.12 TCR-transgenic mice (8) in vitro with RAW264.7 macrophage-like cells pulsed with the cognate p60449–457 peptide. The advantage of this approach is that p60449–457 forms unstable complexes with H-2Kd, with a half-life of 1 h at 37°C (9). Therefore, Ag presentation by peptide-pulsed macrophages is likely to be transient due to peptide dissociation and destruction by serum proteases. Nevertheless, to ensure better removal of antigenic stimulation, we purified the p60449–457-specific CD8 T cells away from the peptide-pulsed RAW264.7 cells after 24 h of stimulation and placed them with nonpulsed vs peptide-pulsed macrophages in the presence of exogenous IL-2. 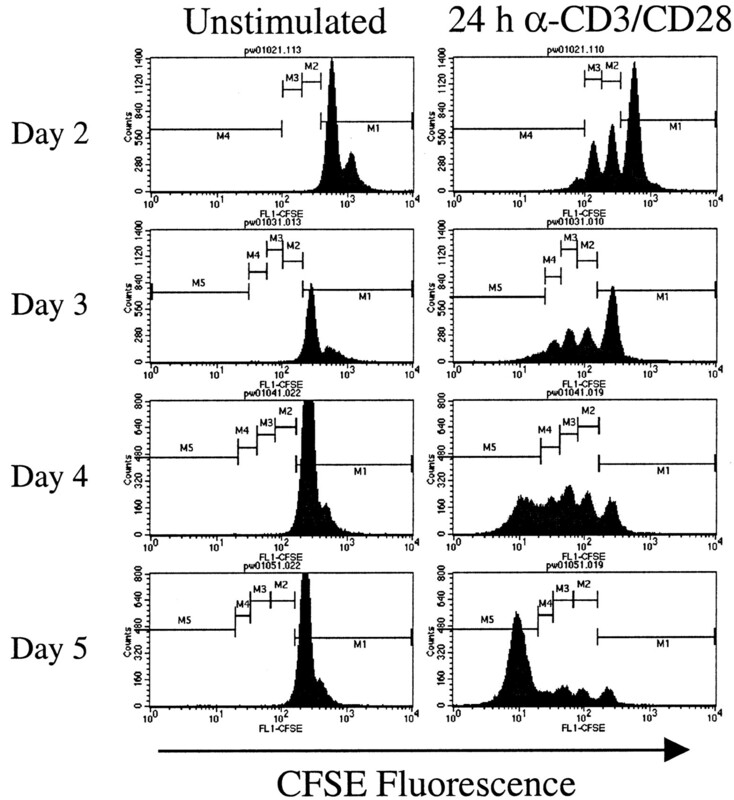 Daily analysis of the proliferation of p60449–457-specific T cells showed that peptide-stimulated CD8 T cells began dividing after 2–3 days and continued to divide for 7 days whether placed in the presence or absence of further antigenic stimulation (Fig. 2⇓ and data not shown). These results strongly support the hypothesis that the proliferation of Ag-specific T cells continues in the absence of Ag and that multiple cycles of cell division can result from transient Ag exposure. Transient stimulation by cognate peptide Ag induces multiple cycles of CD8 T cell division in vitro. Ag-specific CD8 T cells purified by MACS from WP11.12 TCR-transgenic mice were CFSE-labeled and cultured for 24 h with p60449–457 peptide-pulsed or nonpulsed RAW264.7 macrophages. The T cells were then MACS-purified away from APCs and plated with nonpulsed RAW264.7 cells in the presence of exogenous IL-2. Flow cytometric histograms of CFSE dilution on CD8+TCR+ cells is shown for days 2–7 following T cell stimulation. Although the instability of H-2Kd/p60449–457 complexes makes it unlikely that Ag persists following the removal of the CD8 T cells from peptide-coated RAW264.7 cells, the absence of Ag, perhaps in the form of T cell-associated exosomes (10), cannot be completely ruled out. Therefore, we stimulated naive p60449–457-specific CD8 T cells in vitro with plate-bound anti-CD3 and anti-CD28 for 24 h, transferred them into fresh wells that were either coated or not coated with these Abs, and cultured the cells in the presence of IL-2. As demonstrated in Fig. 3⇓, proliferation of activated T cells continues for at least 4 days following their removal from antigenic stimulation. Unlike cells transferred into wells coated with Abs, those transferred into noncoated wells rapidly decreased expression of the T cell activation marker CD69 (data not shown), confirming loss of TCR stimulation. Because T cells are clearly removed from the source of antigenic stimulation in this experiment, these results provide further evidence for Ag-independent T cell proliferation following priming. As expected, T cells cultured in the continuous presence of anti-CD3/anti-CD28 stimulation divided rapidly and diluted their CFSE fluorescence after 4 days (data not shown). Short-term T cell stimulation by plate-immobilized anti-CD3 and anti-CD28 mAbs promotes continued CD8 T cell proliferation for at least 96 h in vitro. MACS-purified CD8 T cells from BALB/c mice were CFSE-labeled and cultured for 24 h in wells containing 0 or 25 μg/ml immobilized anti-CD3 and anti-CD28 mAbs. Cells were then transferred to new wells without Abs, in the presence of exogenous IL-2. T cell proliferation was assessed by flow cytometric analysis of CFSE dilution on the indicated days following stimulation. Data presented are representative of four experiments yielding similar results. Recent studies have demonstrated the roles of IL-7 and IL-15 in homeostasis of naive and memory T cells (11, 12, 13, 14). However, the role these cytokines play in proliferation of Ag-specific T lymphocytes and the establishment of Ag-specific effector and memory populations during infection is unknown. While the importance of IL-2 in promoting T cell proliferation during immune responses is incontrovertible, we decided to determine whether IL-7 and/or IL-15 could augment or substitute for IL-2 during Ag-independent proliferation of activated T lymphocytes. We found that addition of IL-7 or IL-15 to IL-2 significantly increases the population of CD8 T cells that have proliferated by day 5 in response to as little as 2.5 h of stimulation with anti-CD3/CD28 (Fig. 4⇓). 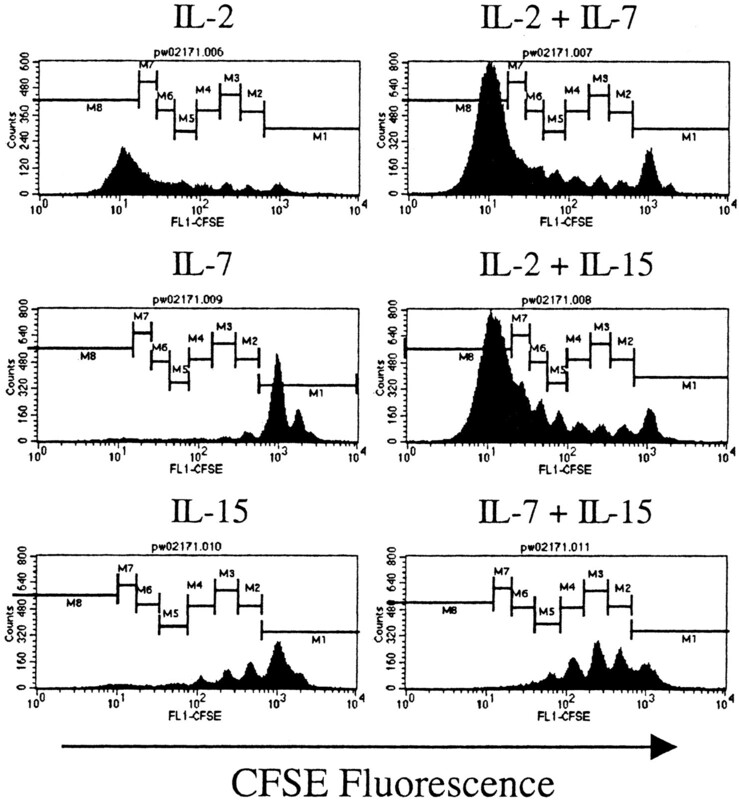 Neither IL-7 nor IL-15 alone, or the combination of these two cytokines, promotes the same degree of T cell proliferation as their combination with IL-2 when assayed 5 days following stimulation. Interestingly, however, the combination of IL-7 and IL-15 promotes a burst of cell division that exceeds the proliferation seen with either of these two cytokines alone. In the absence of TCR stimulation, proliferation does not occur, even with added cytokines, and transient TCR stimulation of T cells without added cytokines results in rapid death and no detectable proliferation (data not shown). IL-7 or IL-15 in combination with IL-2 enhances Ag-independent expansion of transiently stimulated CD8 T cells. MACS-purified, CFSE-labeled CD8 T cells from WP11.12 mice were stimulated for 2.5 h with 0 or 30 μg/ml plate-immobilized anti-CD3 and anti-CD28 mAbs, transferred to new wells without Abs, and cultured in the presence of the indicated exogenous cytokines. Flow histograms of CFSE fluorescence for CD8+ gated T cells are shown for day 5 poststimulation and are representative of two experiments showing similar results. Previous studies from our laboratory have indicated that the magnitude of T cell responses to infection is not amplified by increasing the Ag dose once a threshold for T cell priming has been reached (15). To determine the impact of Ag dose on Ag-independent T cell proliferation, we transiently stimulated CD8 T cells in vitro with 30, 10, or 3 μg/ml of anti-CD3/CD28 for 2.5 h and then followed their proliferation in the absence of further Ag. Fig. 5⇓ demonstrates that similar degrees of proliferation were induced by stimulation with 30 or 10 μg/ml of plate-bound Ab, but 3 μg/ml did not stimulate significant T cell proliferation. This result is consistent with our previous findings indicating that the in vivo T cell burst size is not enhanced by either the dose of Ag or the duration of Ag presentation. Ag-independent T cell expansion is not significantly amplified once a threshold dose of antigenic stimulation is provided. MACS-purified, CFSE-labeled CD8 T cells from WP11.12 mice were stimulated for 2.5 h in wells containing the indicated amounts of plate-immobilized anti-CD3 and anti-CD28 mAbs, transferred to new wells without Abs, and cultured in the presence of exogenous IL-2 and IL-7. Shown are the flow histograms of CFSE fluorescence in CD8 T cells on days 2 and 4 poststimulation. The role of Ag in driving in vivo T cell expansion during immune responses has not been well defined. Although bystander proliferation of memory-phenotype T cells can be induced by IL-15 in an Ag-independent manner (14), studies have indicated that most expanding T cells during viral infection are Ag specific (16, 17). However, it has not been clear whether the generation of expanded populations of Ag-specific T cells requires continual access to Ag. In this regard, it is interesting to note that homeostatic proliferation of naive T cells in lymphopenic environments depends upon continued interaction with specific TCR ligands (18, 19), whereas memory T cells can divide in the absence of cognate MHC molecules (20). In this study, we show that transient antigenic stimulation of naive CD8 T lymphocytes induces their proliferation for up to 6 days following removal from antigenic stimulation. Although T cell proliferation is not dependent upon Ag, exogenous cytokines, particularly IL-2, are critical for continued T cell division. The size of the responding T cell population is positively influenced by the addition of either IL-7 or IL-15, two cytokines that have been implicated in CD8 T cell homeostasis (11, 12, 13, 14). Our findings suggest that these two cytokines may play a role in supporting the expansion of Ag-specific T cell populations during immune responses to infection. Our results differ somewhat from those of a recent study suggesting that sustained TCR signaling of at least 6 h in the presence of costimulation is required for naive T cell proliferation, a process that is not significantly augmented by exogenous IL-2 (21). However, that report investigated CD4 T cell responses to cognate peptide-MHC complexes; it may be that stimulation with anti-CD3 mAbs in our study gives a stronger TCR signal that decreases the duration required for commitment to cell division. Also, we have not formally excluded the possibility that a longer duration of signaling may be required for proliferation under conditions of suboptimal IL-2 availability. In this regard, we have preliminary data demonstrating that CD8 T cells activated in vitro for 12 h can proliferate at least four times in vivo in naive mice in the absence of added exogenous IL-2. We are currently investigating the requirements for in vivo Ag-independent CD8 T cell expansion following in vivo priming. The ability of CD8 T lymphocytes to undergo prolonged division in the absence of Ag provides an explanation for the finding that the kinetics of Listeria-specific CD8 T cell expansion are not influenced by the severity or duration of infection (8). Moreover, it is consistent with observations of synchronous T cell expansion to Ags that are present in vastly different amounts and that differ in their stability (6). Based on our findings, it is likely that infection with L. monocytogenes primes CD8 T cells during the first 24–48 h and that subsequent expansion occurs regardless of whether or not Ag is further presented. We propose that T cell expansion is not driven by the continued presence of Ag, but rather occurs without any requirement for further signaling through the Ag receptor after the initial stimulation. What factors are responsible for driving Ag-independent T cell expansion following TCR activation? Cytokines clearly play an important role in allowing survival and proliferation of activated T cells, and it has been shown that cytokine-mediated signals can control lymphocyte proliferation by regulating the expression of cell cycle proteins that control entry into the S phase of the cell cycle (22). We have shown that provision of at least IL-2 is necessary in our in vitro system, which is consistent with other studies demonstrating its importance in T cell proliferation (23, 24, 25). However, other cytokines such as IL-7 and/or IL-15, which have been recently implicated in regulating naive and memory T cell homeostasis (11, 12, 13, 14), may play important roles for in vivo T cell expansion following antigenic stimulation. Indeed, one recent report has demonstrated that IL-15 may be critical for initiating T cell division in vivo, whereas IL-2 may limit the magnitude of expansion of cycling cells (26). Inflammatory cytokine and chemokine secretion has been demonstrated in L. monocytogenes-infected tissues and the local cytokine milieu likely provides the exogenous stimuli that promote continued T cell division for 7–8 days following initial infection. In support of this, we have recently shown that increased expansion of activated T cells can be achieved by inflammation induced by a second bacterial infection in the absence of specific Ag (27). Whether IL-7 or IL-15 plays a role in promoting in vivo proliferation of L. monocytogenes-specific T lymphocytes during infection remains unknown and is currently being investigated. Other factors such IFN-γ, perforin, and costimulatory signals through CD28 have also been shown to influence T cell expansion (28, 29, 30) and may play roles in Ag-independent T cell proliferation in vivo. We thank Ingrid Leiner, Rielle Giannino, and Patrick Guirnalda for excellent technical support. 1 This work was supported by National Institutes of Health Grants AI-39031 and AI-42135. ↵3 Abbreviation used in this paper: LLO, listeriolysin O.